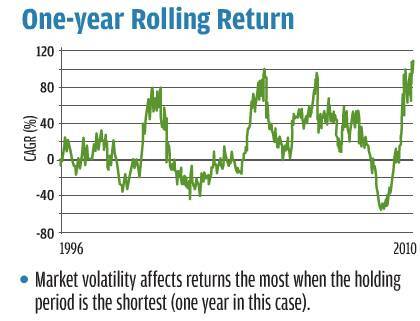 Although much can be written on investing in this great asset class but i found these analysis explaining the rationale behind long term investing very well. W.R.T. 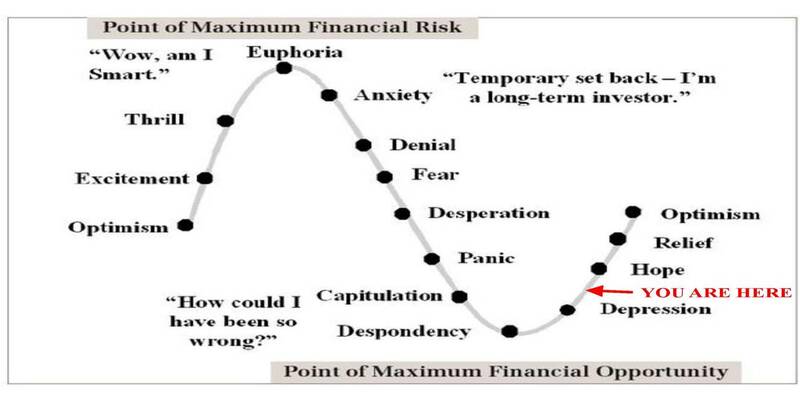 investment decisions,Human Behavior is a cycle which repeats every now and then .We start with a great optimism, go to the peak of euphoria thrilled by the phenomenal rise in stock prices and come to the stage where panic starts.Again when the tide turns with a second rally in market we reach to the same euphoria.The biggest mistake in our personal behavior is that we enter the markets when it has already gained excitement which do not last long and a sudden change in the run brings the depression.We experience this behavior in every cycle till we feel the markets are not for us.Thus as an investor we always lounge for the short term gains rather then being invested in the long term. 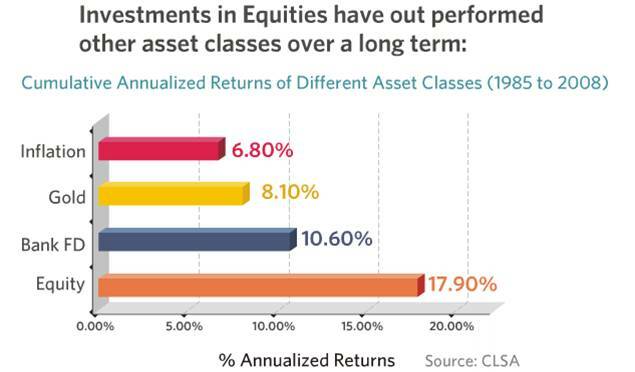 This is an analysis done by CLSA which shows the performance of different asset classes from 1985-2008. Very truly, equity has outperform all other asset classes by beating inflation with a good margin.Gold has been near its long term return of 9% which is the realistic return. 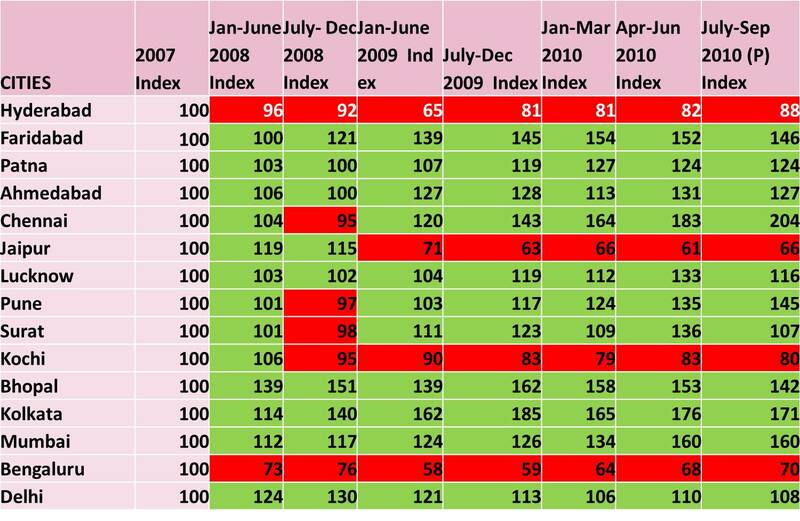 This has been the favorite among all investors and perception, it always make money for you.This is a Reality Index launched by National Housing Bank which shows that this asset classes is heavily dependent on the city you live in and can give you negative returns continously. Looks like life line of a heart patient …..One year horizon in equity markets will always keep your heart beatings volatile. Yeah..That’s a healthy lifestyle…..ten year investment in stock market does nullifies those negative zigzags in your investments. 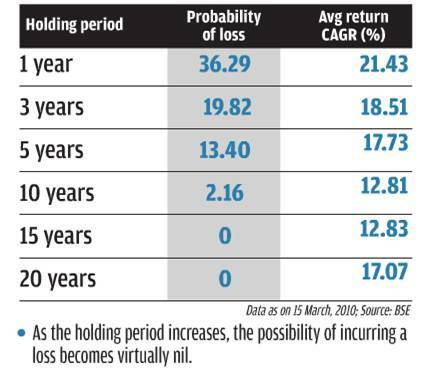 The probability of incurring losses reduces to 0 if invested for more than 15 years and has generated 17% CAGR for 20 years horizon.Risk free investment with high returns. 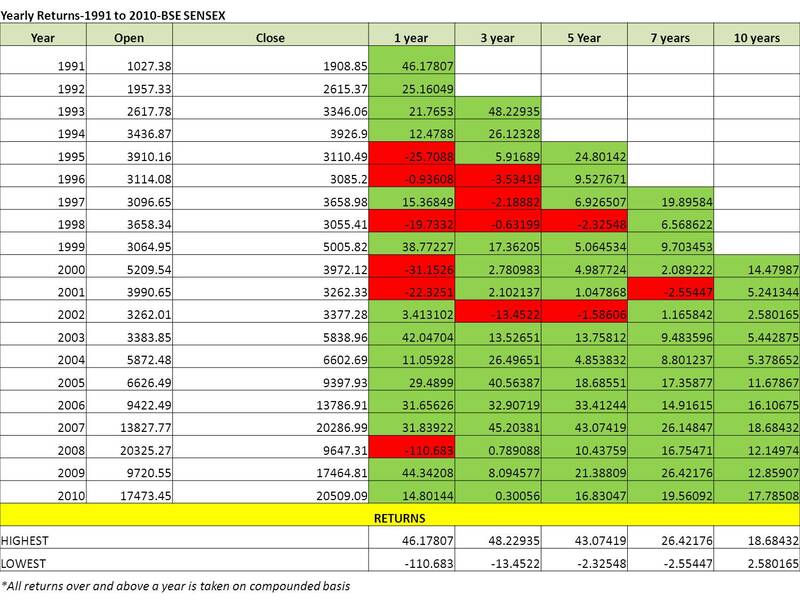 Does investing for one year gives you enough reward for the risk you have taken?.The analysis of returns from sensex during 1991-2000 gives you enough evidence to prove why long term investing is more rewarding.If invested only for one year the highest one has earned is 46% but carried the risk of erasing the capital by 110%. The reward does not seems to be enough to take such a high risk. But if invested for ten year horizon the minimum you earn is 2% and highest 18%. 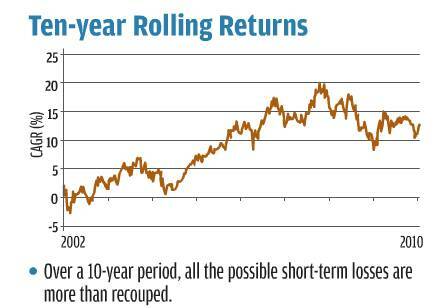 These analysis is done for past performance of equity markets which does not represent future but one should not expect a turnaround.Long term investing has various reasons to give you the performance as indicated contrary to short term investments. Excellent article. Clearly articulates the value of investing in equity. Do you have any articles that explore generating monthly income from a MF/Equity portfolio? I am interested in this subject, since I am contemplating early retirement. I intend to keep 2-3years worth of monthly income through debt sources (FDs, MIPs etc), but beyond that, I would like to secure monthly income through an equity portfolio. Any data/thoughts would be much appreciated. I am in the process of writing one such article.It highlights how you can design a retirement portfolio by investing in equity mutual funds or equity. Sounds good. I will be eagerly awaiting the article.